The Elementary Education Act of 1870: Landmark or Transition? The Education Act of 1870 was only one of several factors contributing to the onset of universal schooling and literacy in England. 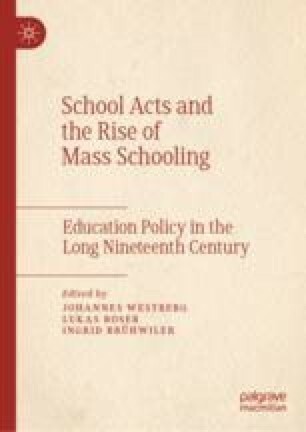 Much of the growth of state involvement in the provision of elementary schooling occurred otherwise than through explicit Parliamentary Acts. Nevertheless, there are grounds for identifying the passage by Parliament of the 1870 Education Act as a landmark event. After considering interest-group and nation-building interpretations of this Act, this chapter argues that it is most appropriately seen as exhibiting the agency of politicians as well as the importance of their interaction with local civil societies in implementing the complexities of establishing universal access to publicly funded and supervised elementary schools. Education Act of 1870. Accessed October 18, 2018. http://www.educationengland.org.uk/documents/acts/1870-elementary-education-act.html. Everett, Michael. “The Privy Council.” Briefing Paper, U.K. House of Commons Library, Number CBP7460, February 8. Accessed February 14, 2018. www.parliament.uk/commons-library.